Worldwide, the effects of honeybees Apis mellifera as exotic pollinators are contentious, and in Australia, the wide range of plant species potentially impacted calls for a strategic approach to conservation risk assessment. We conducted a comparative, experimental test of the hypothesis that introduced honey bees reduced effective pollination in bird-adapted (but not insect-adapted) plant species. Our results did not support this hypothesis. This means that plant conservation managers and policy makers can not use this characteristic as a short cut to assessing the risk honeybees might pose to a plant species’ conservation status. Other characteristics, such as self-incompatibility, may be more telling in this regard, but further study is needed to test this idea. We found that honeybees were the most common visitors to Grey Spider Flower (Grevillea sphacelata) populations in Royal National Park, NSW, but six native insects, including flies, were also potential pollinators. Honey bees visited Grey Spider Flower flowers 63 times more frequently than all native insects combined. However, when we looked more closely at honey bees while they were visiting flowers, we found that they rarely picked up visible amounts of pollen (5 of 880 honeybee visits). They also tend to move methodically from one flower to another on the same plant before they move on to another plant or return to the hive. The plants studied were generally self-incompatible, so the fact that honey bees seemed to rarely move pollen from one plant to another might explain why when we added extra pollen from other plants, flowers produced 4–13 times more fruit than open-pollinated plants. This surprising result suggests that honey bees are not “supplementing” pollination of this insect-adapted plant, but in fact they might be restricting fruit set by removing pollen from flowers but not depositing it on flowers of another plant. 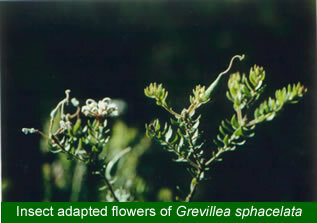 The Grey Spider Flower might be adapted to receiving relatively few visits from native insects (thus retaining flowers for a relatively long time), and native insects might move more erratically, but more detailed studies of native insect behaviour are needed to clarify this. We did not assess whether this low fruit set is likely to lead to declines in Grey Spider Flower populations. At two hanging swamps in the Blue Mountains National Park, honey bees were the only potential pollinators we observed visiting G. acanthifolia inflorescences from which birds were excluded, but in five out of six experiments, over three years, there was no difference in the amount of fruit produced compared to those visited by New Holland Honeyeaters and honey bees. In the remaining experiment, our prediction that excluding birds would decrease fruit set held up, but even so, the difference seemed quite small, because even though these inflorescences had on average 53 flowers, those inflorescences which produced fruit generally produced only one. 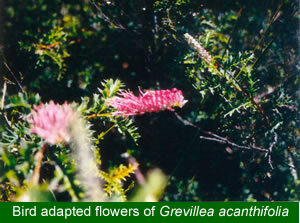 Our behavioural observations suggests that New Holland Honey Eaters are much more likely than honey bees to hybridise Grevillea acanthifolia with G. laurifolia which occurs on upland areas adjacent to the hanging swamps, so honey bees may be restricting the potential for new naturally arising G. x gauchaudii cultivars, although we did not study this in detail. Funding from the Australian Flora Foundation made it possible to also assess whether the seeds produced by honey bees were inferior in genetic quality than those produced by birds and honey bees. Surprisingly, fruits were highly outcrossed regardless of whether birds were excluded. This study demonstrates, through experimental comparison of two closely related plant species, that apparent floral adaptations to insects or birds can not be used as a short cut method for determining the effects of honey bees on fruit set and seed quality. There is still a need to identify general characteristics of Australian plants which might make them vulnerable to negative effects of honey bees. Such general characteristics would help identify specific management actions for plant species at risk from honey bees, without inappropriately limiting the economic benefits of domestic honey bees or going to great expense to remove feral honey bees unnecessarily. In our view, further study of potential honey bee effects should focus on the role of breeding systems to test the hypothesis that honey bees limit the fruit set of self-incompatible species but not species with mixed breeding systems. Comparing sites from which feral honey bees were removed with sites where honey bees are abundant would greatly strengthen such comparisons. For example, some plans of management for National Parks in New South Wales have identified feral honey bee control as a management priority. However, considering the expense of honey bee removal, implementation of this management priority where it has been identified should be coordinated with pre- and post-implementation ecological studies. We would expect other plant life history characteristics to interact negatively with honey bee effects, including an inability of adult plants to survive fires, short seed viability, and long juvenile period. In addition to comparative studies of plant species, insect population and behaviour studies might shed more light on the resilience of native pollination systems following changes in honey bee populations.